Stile Antico, the British choral group, presented the final concert in the Boston Early Music Festival’s 2012–13 concert season last Friday night at Cambridge’s St. Paul Catholic Church in Harvard Square. Comprising twelve mixed voices—six men and six women—the relatively new group is already the heir apparent to the Tallis Scholars, for decades the Festival’s favored visiting vocal ensemble from Britain (both groups are booked to return next year). Unlike the Tallis Scholars, directed since its inception by Peter Phillips, Stile Antico makes a point of having no conductor. In performance and in its publicity materials the organization avoids identifying a leader: all twelve members stand in a semicircle open to the audience and follow cues given discretely by members of the group. Vocally, Stile Antico takes a distinct approach as well, eschewing use of the high male voice—the so-called countertenor or male alto—that has been long associated with the English choral tradition. 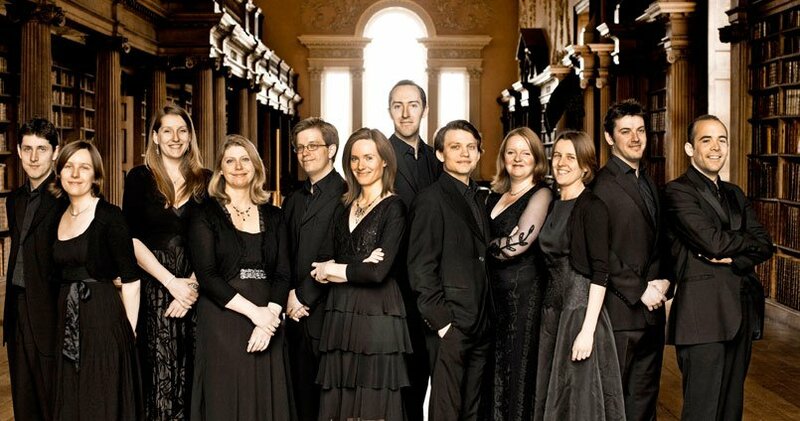 (The Tallis Scholars, by contrast, typically employ both female and male voices on alto parts.) Although most members have been and continue to be involved in Anglican music making, Stile Antico’s basic sound stands at some distance from that of the 20th-century British choral tradition. Without adopting a modern or operatic approach, they apply a full-voiced manner to most works, avoiding any suggestion that they might be emulating the sound of a conventional Anglican cathedral choir, with its boy (and girl) sopranos and male falsetto altos. Friday’s program was, as one of the members put it in brief remarks, “a guided tour of Renaissance sacred music.” More precisely, it included favorite selections from three or four of the major traditions of 16th– and early 17th-century sacred music—twelve Flemish, Italian, Spanish, and English works—together with one German composition and a new work by the contemporary English composer John McCabe. This last work, commissioned for Stile Antico and first performed in 2009, was for this listener the highlight. Set to an English passion text previously used by the Tudor composer William Cornysh (d. 1523), “Woefully arrayed” is characteristic of McCabe’s music in echoing older music from the Renaissance to neoclassical Stravinsky, while incorporating distinctive and sometimes arresting new timbres. Here the opening words (referring to Jesus on the cross) serve as a refrain, set in sustained sonorities that initially correspond with familiar chords but which shade in and out of tonality as the work progresses. Contrasting sharply with this are dissonant, staccato outbursts on such phrases as “with whips sore fretted.” This was perhaps the best-sung work on the program, utterly sure in every matter of pitch, dynamics, and ensemble. Coming at the end of the first half, it was met with sustained applause—an indication that this early-music audience was completely receptive to the inclusion of new music on such a program. No other work made an equally strong impact, at least on this listener. One problem with this sort of program is that, in hearing a series of varied works rarely more than five minutes in length, one never has a chance to become completely absorbed in the details of a particular composer’s style or approach. Nor, given the particular ordering of the works on this program, was there an obvious logic or coherence to the evening’s choices, other than a tendency to favor settings from the Song of Songs. These provided texts for five works, two of them setting the verses that begin “Veni, dilecte mi” (Come, my beloved). It didn’t help, however, that most works were sung by the full ensemble of 12 voices, regardless of the number of distinct vocal parts. Hence, despite the breadth of variety in compositional styles, there was not a huge variety in actual sound. Theirs is, fortunately, a very good basic sound. Particularly in the last work, a polychoral 12-part “Tota pulchra es,” the one-voice-on-a-part performance resonated so beautifully in the large space that one hardly missed the organ and other instruments that probably accompanied this works original performances. Composed by the Hamburg organist Hieronymus Praetorius (not the better known Michael Praetorius), the work incorporates the slightly pedantic musical rhetoric that was favored by German imitators of Gabrieli and other Italian composers. It nevertheless received a very fine performance, as did Tomkins’s “O praise the lord,” which opened the second half. Both are as much “Baroque” as “Renaissance” works, as we understand those terms, and as such particularly suited to the forthright approach that Stile Antico adopted here. I was not equally convinced by their approach in other works. It was good to hear the Magnificat of the First Tone by Nicolas Gombert, the first and longest work on the program. Alternating between verses sung in chant and in polyphony, it represents the generation of composers between Josquin and Palestrina. Their music, focusing on contrapuntal dexterity, lacks the more obvious virtuosity of their predecessors and the musical rhetoric of their successors, and it therefore is less often performed. I didn’t feel that this performance brought Gombert’s counterpoint to life, and I felt the same in “Ego flos campi” by Gombert’s contemporary Jacob Clement (known as Clemens non papa). Though sung beautifully, it was simply too slow, and instead of lines I heard chiefly a succession of resonant sonorities. Stile Antico’s approach certainly worked in William Byrd’s “Vigilate.” The Advent text is the basis of one of the Elizabethan composer’s “most dramatic motets,” as bass Matthew O’Donovan put it in his fine program notes. He might have added that this work avoids the over-extended length of some of the other relatively early compositions that were issued alongside it in the composer’s 1589 Cantiones sacrae (Sacred Songs). The sharp dynamic contrasts and staccato articulation of this performance were too aggressive for my taste—and could not have been used in the work’s first, secret performances in aristocratic Catholic households during the reign of Elizabeth I. But although distracting attention from the more thoughtful aspects of Byrd’s setting, they certainly did produce a dramatic reading of the text. Other works, although equally well sung, made less of an impression on this listener. Another “Veni dilecti mi,” by Sebastián de Vivanco, includes some typically Spanish rhythmic play early on but thereafter lost intensity, at least in this performance, despite its lively double-chorus setting. A four-part “Hortus conclusus” by the little-known Andalusian composer Rodrigo de Ceballos also proved rather non-descript, although it might not have been helped by coming toward the end of a fairly packed program. Also performed were John Sheppard’s setting of the Lord’s Prayer, Gibbons’s “O clap your hands,” an “Exultate Deo” by Palestrina, and Victoria’s “O magnum mysterium.” Thomas Tallis was represented by “In pace” as well as by his setting of St. Thomas Aquinas’s “O sacrum convivium,” which served as an encore piece. A word about the “pre-concert talk” that preceded the performance: Given that two thirds of the concert’s 48-page program booklet was devoted to marketing or fund-raising in one form or another, it may be no surprise that the first two of the three pre-concert speakers devoted their remarks to enthusiastic descriptions of Stile Antico’s current CDs and performance tours. Such comments may create a bond with certain members of the audience, perhaps narrowing the distance that allegedly separates some listeners from “classical” music. Yet those hoping to learn something about the actual music on the program had to wait for what turned out to be some disappointingly superficial historical background, delivered none too clearly and without illustrations in the church’s somewhat echoey acoustic. I was glad though to be reminded through these remarks that some of this music was written not for public services in large buildings but for private domestic performance—a point though that, applied above all to the work by Byrd, which was nevertheless performed in a notably “public” manner. I am glad too that BEMF continues to include notes as well as complete texts and translations of vocal works in its program booklets, even if the latter must also remind us of the benefactors who have underwritten individual concerts and talks, and if marketing logos must be strewn alongside the names of the actual performers who also have some role in making these events possible. Still, I hope that the presenters of such events will keep in mind that a good talk by an informed and lively speaker, especially one illustrated by live or recorded music examples, can meaningfully further an organization’s educational mission—and might also serve as no less effective marketing than a performance as good and committed as this one.